SEGA Mega Drive Classics Switch review: SEGA does what Ninten…does? Wonderfully portable retro gaming action, but sadly and confusingly limited for Switch owners. It still feels wrong to me to be playing SEGA games on a Nintendo machine. Not just wrong, but almost... sacrilegious. Of course, it shouldn't, because despite what Joe Montana might want to subliminally tell me, that particular console battle was decisively settled decades ago. Still, old habits die hard and SEGA Mega Drive Classics is undeniably a title pitched at those who cling to old gaming habits. I also shouldn't be surprised, because practically ever since it exited the hardware console game, SEGA has made a lot of money by releasing "classic" collections from the Mega Drive (or if you really must, Genesis) era. The chances are if you were around at the time and have fond memories of them, you've had more than a few chances to revisit SEGA's glory days. Gamers complain about Nintendo mining its back catalogue extensively, but I don't think that the original Sonic The Hedgehog has ever been "out of print" in one form or another ever since its debut. At least Nintendo takes a break from time to time! Indeed, we've already reviewed SEGA Mega Drive Classics here at finder, with Adam Matthew declaring it "a tough deal to pass up". Plenty of Switch ports deliver most of the experience of their PS4 or Xbox One counterparts and with the 16-bit era being particularly easy to emulate, this should just be a case of getting it if you're keen, right? There are some subtle differences at play here, partly because of the way the Switch actually works and partly due to some downright odd decisions on SEGA's part when it comes to the Switch port. You still get the same 90s-era-bedroom motif as your menu, complete with a shelf of games that you choose and watch get dropped into a virtual Mega Drive before playing. It's a fun idea, although the terribly pedantic side of my brain gets annoyed that the carts all have a default logo art style to them. I own some of these carts and they're not quite authentically presented. This of course makes no difference to how they play at all, but it irks me personally. The chances are good if you care about the retro side of gaming that it may annoy you equally, although those curious to simply see what gaming was like in the early 1990s won't even notice. You can tweak emulator settings if that's your jam, although again my purist side finds most of the presented filters far too artificial compared to the pixellated originals, even when blown up on a 4K display to sizes they never managed back in the day. Each title has its own inbuilt challenges to beat if you want a deeper challenge than simply beating each title. For those who find the whole retro scene too difficult – some of these games are still genuinely hard – you can pause, save and rewind from any part of any game, obliterating your mistakes with ease. Each game supports up to four save slots, so you can save whenever you'd like as well. In terms of titles, you get (deep breath) Alex Kidd In The Enchanted Castle, Alien Soldier, Alien Storm, Altered Beast, Beyond Oasis, Bio-Hazard Battle, Bonanza Bros, Columns, Columns III, Comix Zone, Crack Down, Decap Attack, Dr. Robotnik's Mean Bean Machine, Dynamite Headdy, Eswat: City Under Siege, Fatal Labyrinth, Flicky, Gain Ground, Galaxy Force II, Golden Axe, Golden Axe II, Golden Axe III, Gunstar Heroes, Kid Chameleon, Landstalker, Light Crusader, Phantasy Star II, Phantasy Star III: Generations Of Doom, Phantasy Star IV: The End Of The Millennium, Ristar, Shadow Dancer, Shining In The Darkness, Shining Force, Shining Force II, Shinobi III: Return Of The Ninja Master, Sonic The Hedgehog, Sonic The Hedgehog 2, Sonic 3D Blast, Sonic Spinball, Space Harrier II, Streets of Rage, Streets of Rage 2, Streets of Rage 3, Super Thunder Blade, Sword of Vermillion, The Revenge of Shinobi, Toejam & Earl, Toejam & Earl In Panic On Funkotron, Vectorman, Vectorman 2 and Virtua Fighter 2. That's quite the list and the odds are it's larger than your Mega Drive collection was back in the day unless you were exceptionally well-off. Like its Xbox One and PS4 counterparts, there are some puzzling omissions, such as Sonic 3 or Ecco The Dolphin, but there's an even stranger exclusion. The PS4 and Xbox One versions included both Wonder Boy III: Monster Lair and Wonder Boy in Monster World, but they're nowhere to be seen in the Switch version. I'd hoped they might be unlockable titles, but the official word from Sega is that they weren't able to include them in the Switch version. That's hugely annoying for gamers who don't care much about licensing deals, but who might want those titles. Not perhaps so much for Monster Lair, which is still deeply average, but for Monster World, which remains excellent... but missing. If anyone at SEGA is listening, I'd gladly trade Alex Kidd In The Enchanted Castle for Wonder Boy in Monster World, partly because it's a much better game, but also to avoid all the obvious jokes about his name and mine. We are not related. It's a real pity, too, because the Switch version has one very evident advantage over the Sony and Microsoft versions of these games, thanks to its innate portability. You can play up on the big screen or even split-screen on the Switch itself, but you can't exactly take a PS4 Pro on the bus with you for a little rapid-fire Sonic or Streets of Rage 2 action. if you think that Streets of Rage 2 is anything but the definitive side-scrolling brawler, then I'm sorry, but you're just plain wrong. There are of course titles that have aged better than others here and your own nostalgic filter might make very different work of them than I do. Although if you think that Streets of Rage 2 is anything but the definitive side-scrolling brawler, then I'm sorry, but you're just plain wrong. SEGA has mined its Mega Drive library so extensively over the years that there's the very real risk that you've already bought these games and indeed quite possibly this collection before. I would score it slightly higher than Adam did in his original review – I think I like the selection of games, including the puzzle ones a little more than he did, and the portability of the Switch adds a whole new dimension – but the fact that it's a lesser selection of titles and especially given they're genuinely great titles at that, knocks it down a mark or two. Still, for the asking price and this many games, you really can't go wrong. 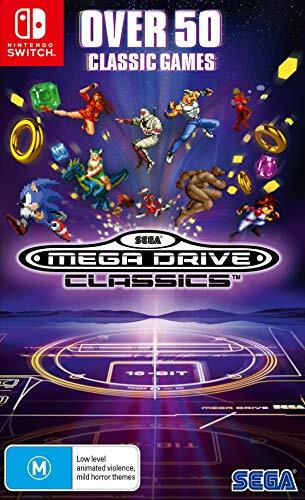 Dive back into the 16-bit era with Sega Mega Drive Classics, a compilation of more than 50 popular Sega titles including Sonic the Hedgehog, Phantasy Star II, Streets of Rage and more. We reviewed SEGA Mega Drive Classics on Nintendo Switch with a copy provided by the publisher. Where are the Wonder Boy games? Switch owners in need of a retro gaming fix will be well served by the SEGA Mega Drive collection, but it's downright annoying that we're getting a lesser package of games that are trivially easy to emulate, even on the lesser processing power of the Nintendo Switch. Sega Mega Drive Classics review: No Ecco or Sonic 3?